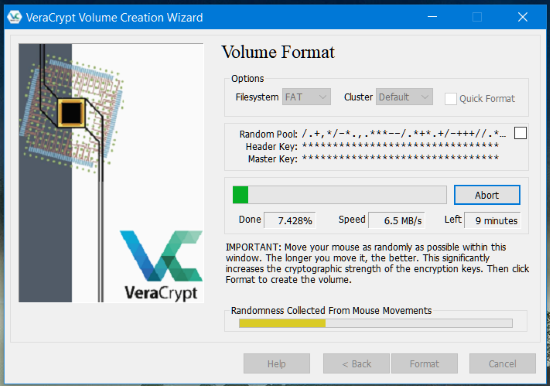 VeraCrypt is open source and completely free encryption software for Windows, Linux, and Mac. It is the successor of the TrueCrypt project. In simple words, you can create a secure, private and password protected partition or a folder or a complete drive. ➤ Creates an encrypted disk and mounts it as a real disk. ➤ Encrypts an entire partition or external storage device such as USB flash drive or hard drive. ➤ Encrypts a partition or system drive where Windows is installed. ➤ Encryption is automatic, real-time(on-the-fly) and transparent. ➤ Data read and write operation is as fast as if the drive was not encrypted. ➤ Encryption can be hardware-accelerated on modern processors. 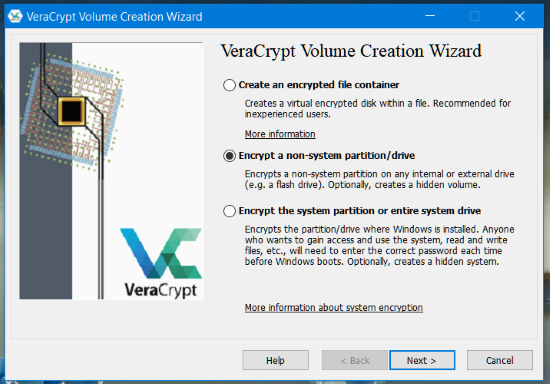 ➤ Download and install VeraCrypt. Available for Windows, Linux, and Mac. ➤ First, you have to create an encrypted drive. You can either create a new virtual drive on the hard disk for storing your private files or convert your external USB drive or external hard disk to make it password protected or encrypt your existing data. 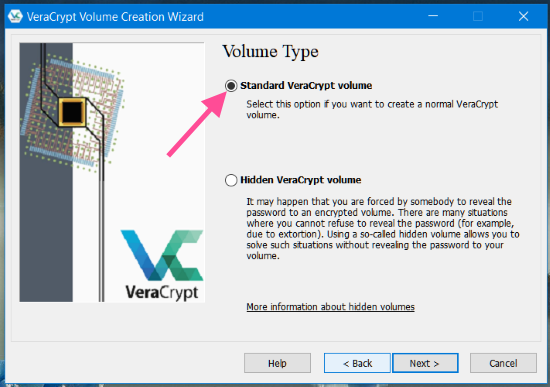 ➤ Open VeraCrypt and click on 'Create Volume'. ➤ Here you have to choose what want to do. ➤ If you want to create a new encrypted drive or want to encrypt the external drive, select second option 'encrypt a non-system partition/drive. Else you can choose other options as you want. All the options are self-explanatory. ➤ Next screen, choose whether the virtual partition should be hidden or not. ➤ Now select the location of the virtual drive or where you want to create an encrypted file. ➤ Here I have selected an external USB drive to completely encrypt the drive and password protect it. ➤ Then select 'Create encrypted volume and format it' to completely delete all the data from the drive and encrypt the drive. If you want to keep the data and still want to achieve encryption, select the second option. ➤ Choose your encryption options. The best method is to keep the default settings. ➤ Give a strong password. ➤ Next, you have to move your mouse randomly until the randomness line is completed. Then hit the format button. ➤ Here all the files will be erased. ➤ After a few moments, your drive is encrypted and you are done with creating a password protected external drive or USB drive. You can use the same procedure for creating a virtual drive on the internal hard disk. The only thing is, the VeraCrypt software needs to be installed on all the systems where you want to mount the encrypted partition. This is important when you are encrypting the external drives. The system where you are going to mount the external partition must have VeraCrypt installed. ➤ Select a drive letter. ➤ Click on 'select file' button and locate the partition or file. ➤ The encrypted storage virtual folder or the external drive is mounted and you should find it as a new partition on your 'This PC' file explorer. If you are not comfortable with any third party encryption software, Microsoft Windows BitLocker can password protect your external USB drive or hard disk using BitLocker. It's built-in every Windows system and you don't have to worry about compatibility on another system. What encryption software do you use?